Data and site monitoring costs are another key barrier that is largely self-imposed by sponsors. In general, industry-sponsored trials are monitored by individuals who visit sites at intervals defined by their company standard operating procedure (SOP) or study-specific monitoring plan. The pharmaceutical industry estimates that monitoring can account for 15 to 30 percent of total trial costs (Davis, Nolan, Woodcock, & Estabrook, 1999). It is common practice in the industry to conduct site visits frequently (every 4-8 weeks), and source data verification (SDV)—the process of ensuring that the reported trial data are complete and consistent with study subject source records—consumes quite a bit of time during these visits (Usher, 2010; Tantsyura, et al., 2010). One particularly costly practice is 100 percent SDV. FDA regulations do not require study monitors to check every single source data point at every investigative site, but risk aversion and a conservative interpretation of the regulations has resulted in 100 percent SDV becoming the industry standard (Korieth, 2011). Seeking to avoid negative outcomes of rigorous site inspection audits (which could threaten drug approval), sponsors have voluntarily borne the extremely high costs of 100 percent SDV by on-site monitors in multicenter trials (Kramer, Smith, & Califf, 2012). Eighty-two percent of pharmaceutical industry sponsors reported always verifying CRF data against source data. By contrast, only half of academic/government/cooperative organizations reported always doing so (Morrison, et al., 2011). A 2008 study found that, on average, SDV consumes one-third of companies’ entire Phase 3 trial budget (Getz K. A., 2011a). Because the cost of SDV depends on the size of the study and the complexity of the protocol, the overall trend toward larger, more complex studies is making it increasingly expensive and logistically difficult to check every data point at every site (Korieth, 2011). Despite its high cost, there is no evidence to suggest that 100 percent SDV significantly improves data quality or likelihood of drug approval (Kramer, Smith, & Califf, 2012). There are a number of possible explanations for this. First, resources are often expended to verify data that is largely or completely irrelevant to study outcomes, such as vital signs or other health information that is not central to the study. Second, it is not likely that drugs will fail to get approval because of SDV issues; there are much more critical areas of concern, such as protocol violations. Third, 100 percent SDV does not even ensure 100 percent accuracy; for a human manually looking for errors, the error rate is 15 percent (meaning the process is only 85 percent accurate) (Korieth, 2011; Society for Clinical Data Management, 2005). Fourth, this approach may lead to the detection of some types of errors (e.g., transcription mistakes), but it does not prevent other data integrity problems (e.g., transcription errors within the source document itself, fraud, misreporting of data by the study participant) (Tantsyura, et al., 2010). Given its enormous costs and the lack of evidence supporting the value of 100 percent SDV, some industry representatives recommend a shift to partial or risk-based monitoring approaches; however, there are key barriers that must first be overcome. The pervasive risk-aversion in the industry is perhaps the biggest obstacle to the adoption of more efficient monitoring practices. There are not yet wellestablished processes or controls for partial or risk-based monitoring, and drug companies are hesitant to change their practices without FDA guidance on what is acceptable. Even though FDA has released draft guidance (in August 2011) on risk-based monitoring approaches (U.S. Food and Drug Administration, 2011c), it is likely that some companies will still continue doing what they have done traditionally because it has proven successful in the past. 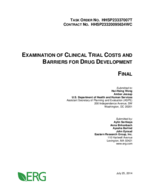 There are also practical hurdles; the most commonly used EDC and electronic clinical trial systems were designed to support 100 percent SDV, so technology vendors must change their systems so that they permit partial SDV before such approaches can be widely adopted by industry (Korieth, 2011). If these barriers can be overcome, the savings for drug sponsors would be enormous. A 2010 study published in the Drug Information Journal found that sponsors could save up to 23.5 percent on Phase 3 oncology study costs by cutting SDV to 50 percent and reducing monitoring frequency accordingly from 6- to 10-week periods (Tantsyura, et al., 2010). The Phase 2 savings are estimated at 16.7 percent. For a cardiology study, the Phase 2 and Phase 3 savings are estimated at 11.6 percent and 14.3 percent, respectively. These cost reductions are a function of reduced per-page review time and reduced number of site visits by monitors, which mean fewer hours spent by monitors on-site and reduced travel expenses (Tantsyura, et al., 2010). “The potential savings are approximately three to four billion dollars in the U.S. alone,” said Vadim Tantsyura, the study’s author and the director of data management for Infinity Pharmaceuticals (Korieth, 2011). It is also worth noting that several sponsors have yet to make the transition from paper-based studies to use of EDC technologies. Though EDC has been gaining ground, the perception that “everyone uses EDC now” is inaccurate; as of 2007, EDC was used in approximately 50 percent of new trials (Neuer, Warnock, & Slezinger, 2010), and the issues surrounding reliance on paper records were still being raised in the April 2012 FDA hearing on modernizing clinical trials. Moving away from paper results in reduced paper handling costs and allows for fewer site-monitoring visits and easier query resolution (Neuer, Warnock, & Slezinger, 2010). It also eliminates inefficiencies arising from transcription of data from paper to electronic format (U.S. Food and Drug Administration, 2012). Though the longer-term cost and time savings that are achievable through adoption of EDC are substantial, the upfront cost of the EDC system is a key barrier for companies (especially smaller companies) considering the switch (Neuer, Warnock, & Slezinger, 2010).